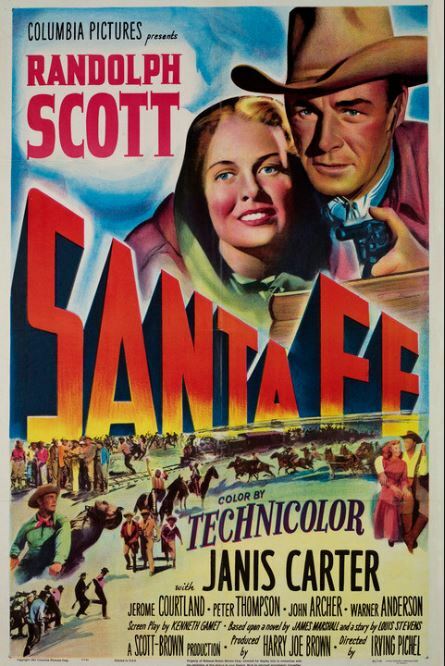 Randolph Scott stars in this 1951 Columbia Pictures western about the construction of the Santa Fe Railway from Atchison, Kansas through Topeka (naturally) to Santa Fe, New Mexico. 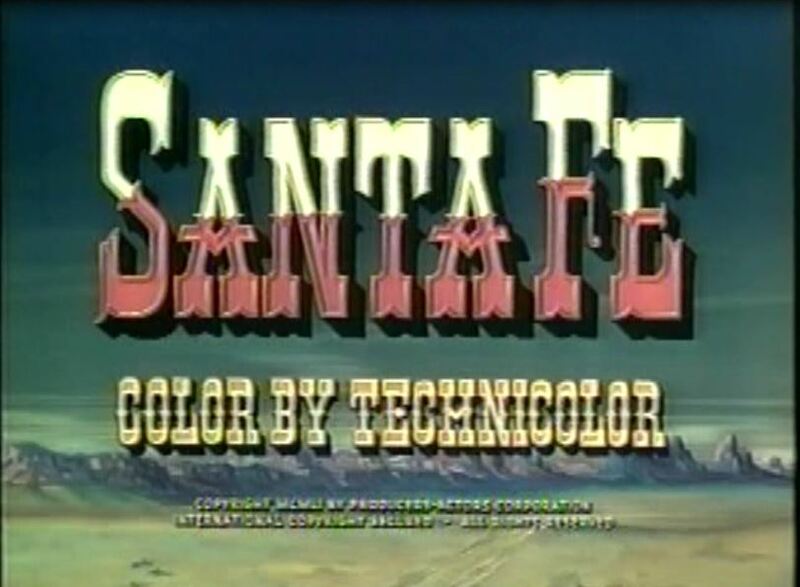 Filmed in Technicolor, this flick features California and Arizona shooting locations (standing in for Kansas/New Mexico). 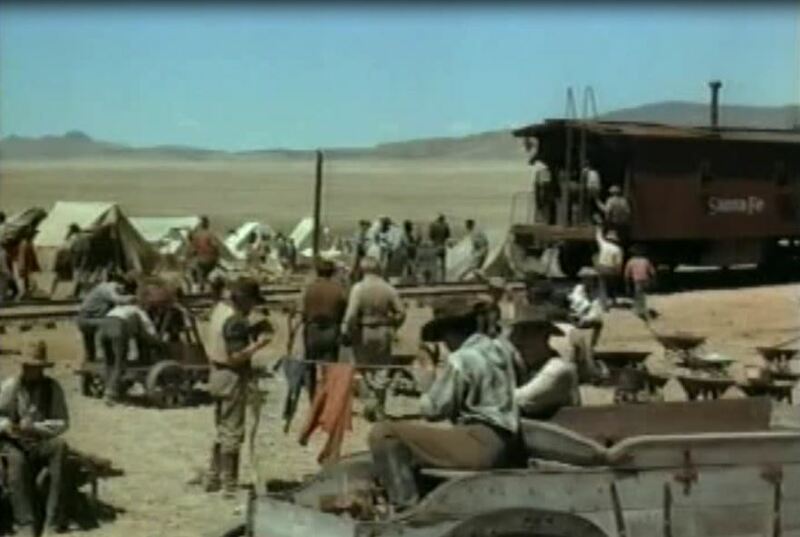 As railroad pictures go, this one has quite a respectible train quotient throughout including a climactic fight scene on a flat car. Let’s check it out! Apologizes for the poor quality of the images. My print of this movie is a little tatty. 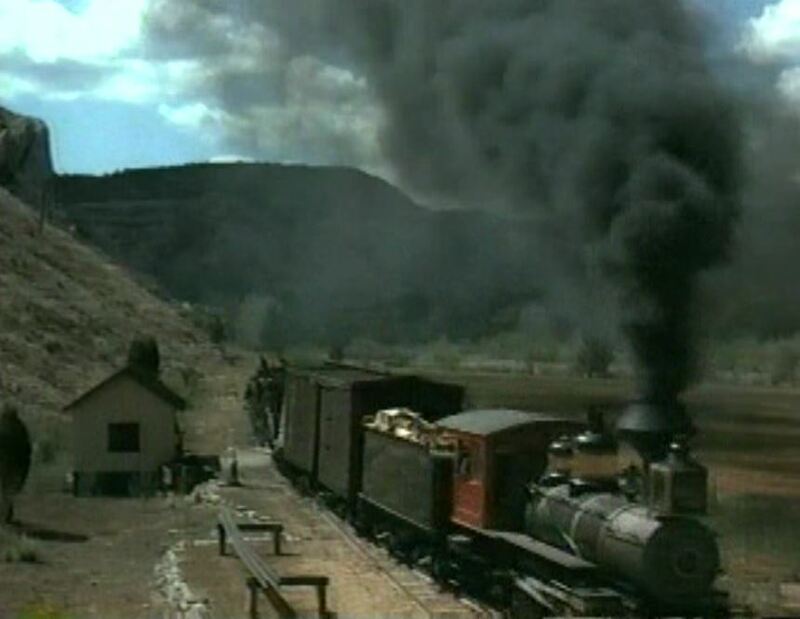 The Civil War is over and many from both sides headed West for new opportunities including construction of the western railroads. 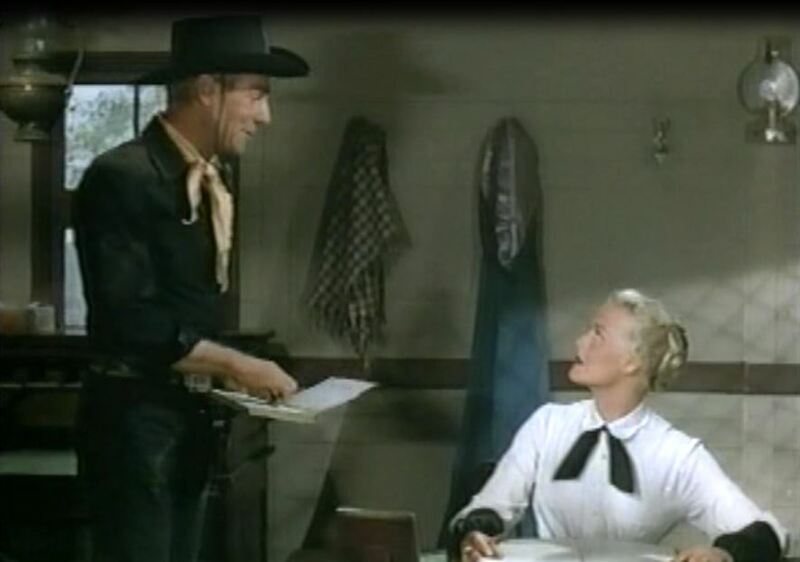 Led by Randolph Scott are the four Canfield brothers formerly from the “largest plantation in Virginia”. 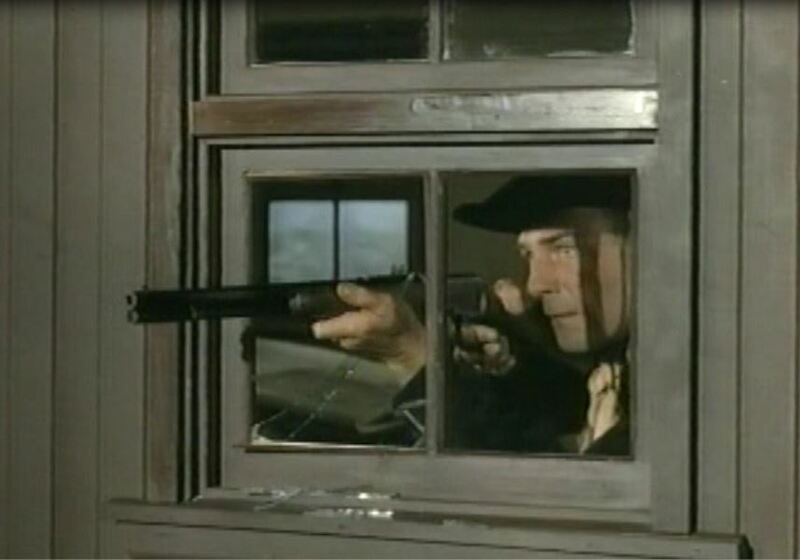 Old loyalties die hard and the Canfields soon find themselves in a Missouri saloon shootout with some loud-mouthed Yankees. 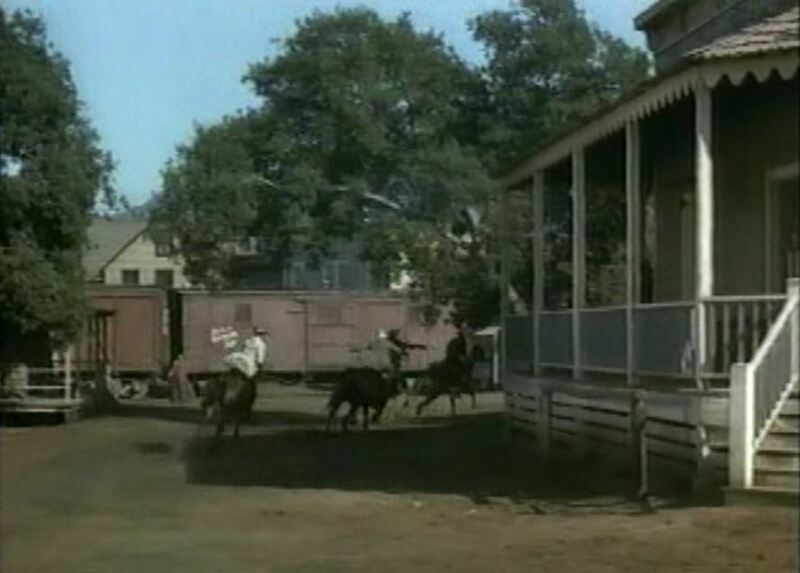 Britt Canfield (Scott) holds back the other 3 Canfields, Terry, Tom and Clint during a barroom confrontation; Things get out of hand and the Canfields take it on the lam. 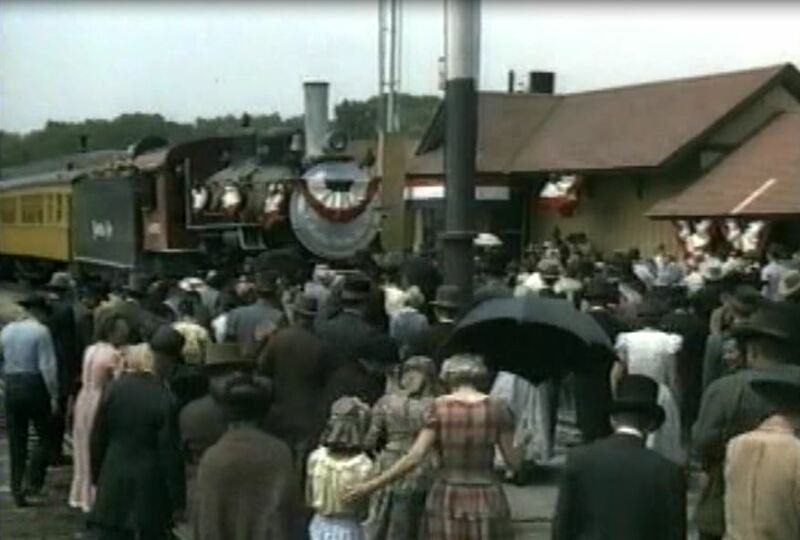 Note the old style box cars in the background. 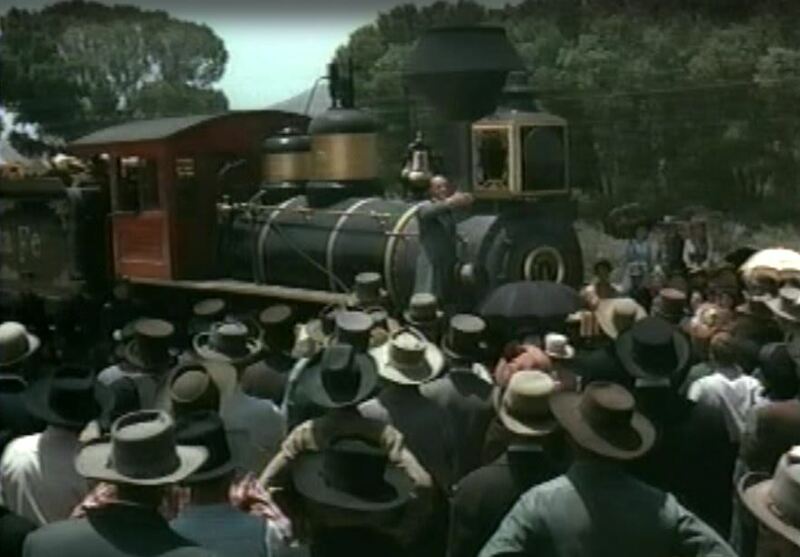 Little Buttercup charges west with a trainload of men towards “end-of-track”; “C.K.Holliday #1” (AT&SF #5 in disguise) faces the townsfolk of Topeka, Kansas. Cyrus K. Holliday was the first President of the Santa Fe Railway and one of the founders of Topeka. 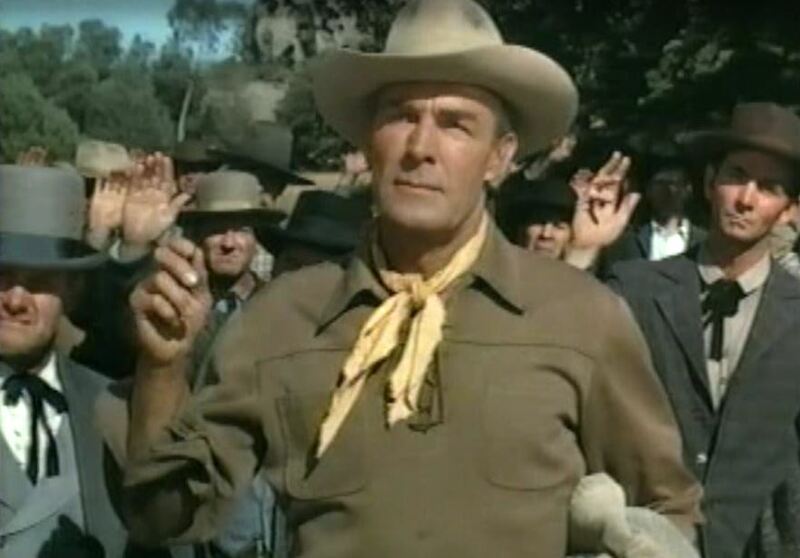 Randolph Scott reluctantly swears his allegiance to the Union before hiring on at Topeka; Next thing you know, Britt (Scott) is at track end supervising construction. 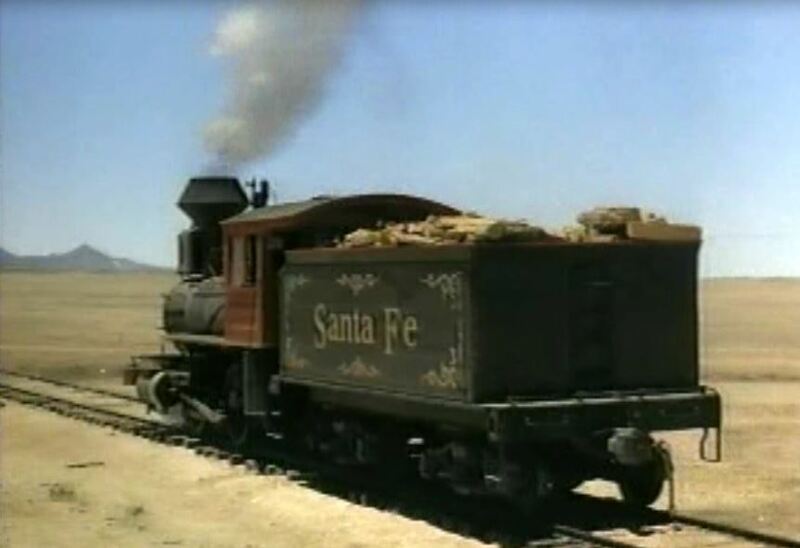 As it turns out, Britt is the only one of the Canfield brothers who joins up with the Santa Fe. 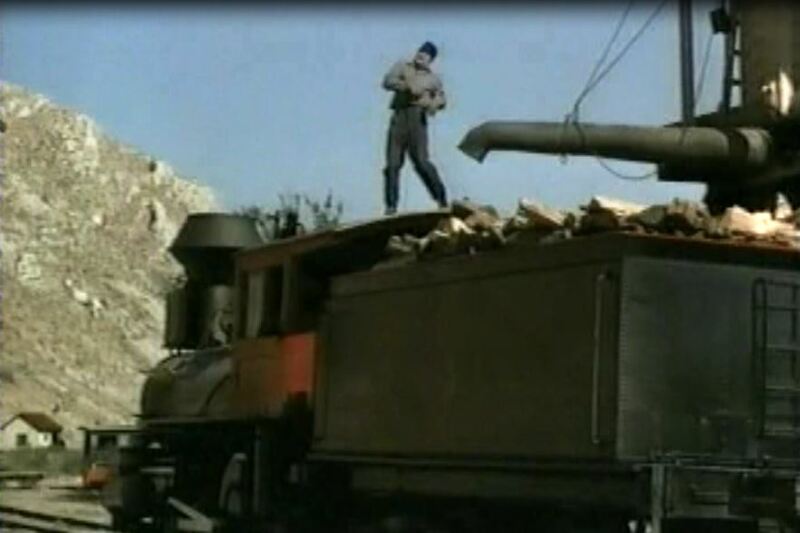 The other three brothers come under the influence of the eeee-vill Cole Sanders (Roy Roberts), and his assorted nefarious enterprises designed to stop or delay the completion of the railway. Comic relief is provided by the engineer and fireman of “Little Buttercup”. The engineer is the jolly Irishman Luke Plummer played by Billy House whilst Dan Dugan (Olin Howland) appears as the gullible (like a fox) fireman. 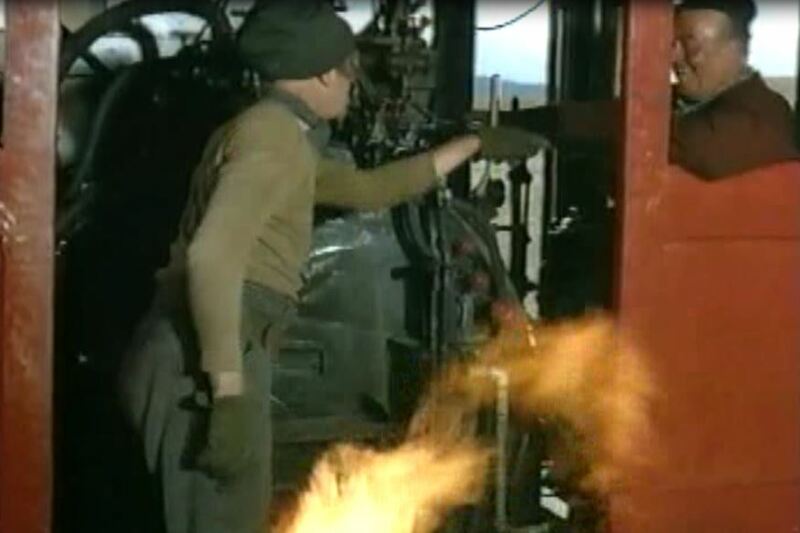 Nice backdraft of flame from the firebox of AT&SF #5; Engineer Plummer looks right at home in the cab of Little Buttercup. 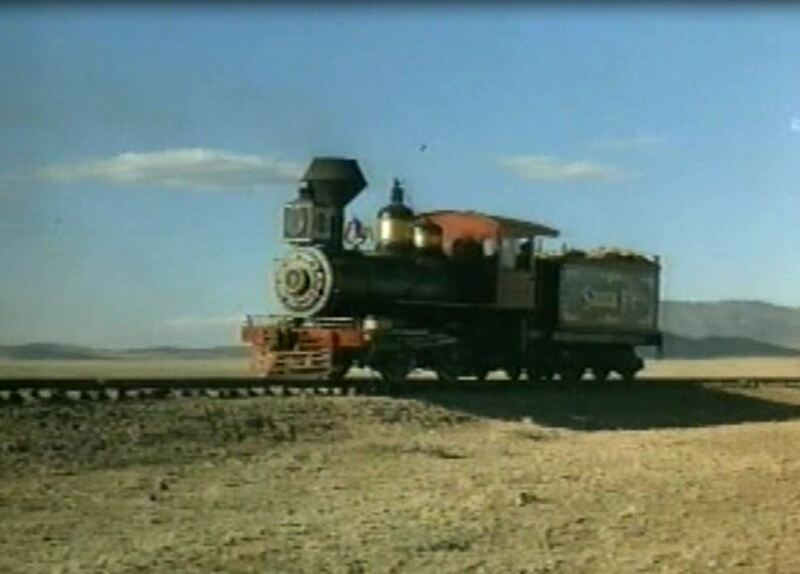 Nice shot of two locomotives facing on a single track. 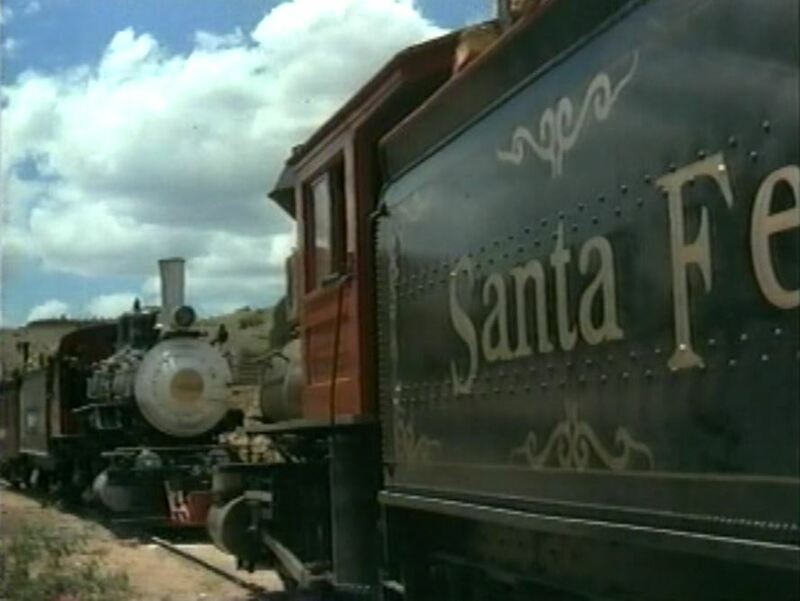 The engine in the background (silver smokebox and tall “shotgun stack”) is AT&SF #9440, a 2-8-0 (thanks to John Moore of Albuquerque!). ; Britt meets up with the snazzy Judith Chandler (played by Janis Carter) with the two inevitably becoming an item. 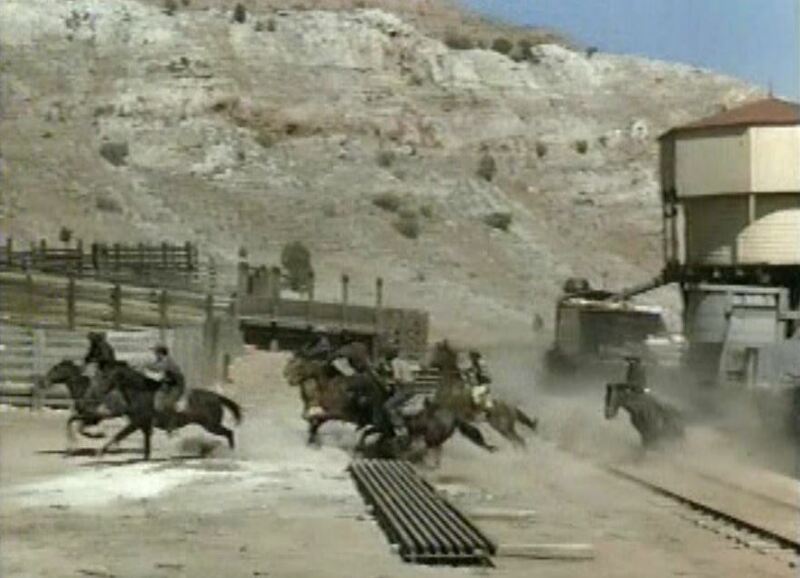 Uh-oh…Injun trouble! 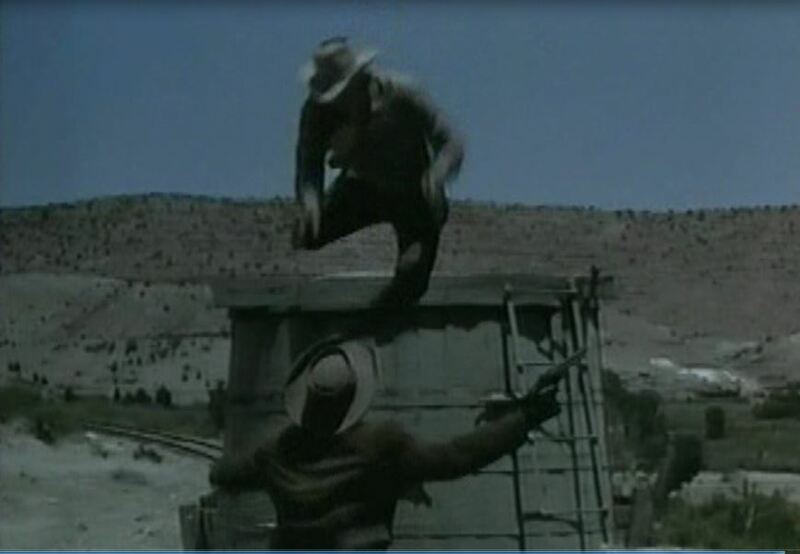 Having a war dance trackside; Randolph Scott defuses the situation by letting the tribe’s chief run the locomotive. 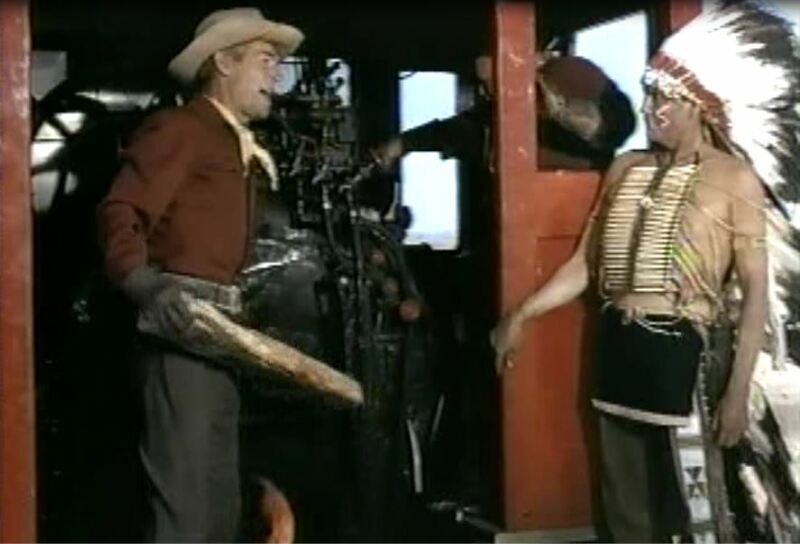 After the chief’s turn at the throttle, Britt wisecracks to the indian, “Maybe they’ll name a train after you” (like the Super Chief…get it?) Note the “S” on the chief’s cheek. That’s almost taking things too far…. 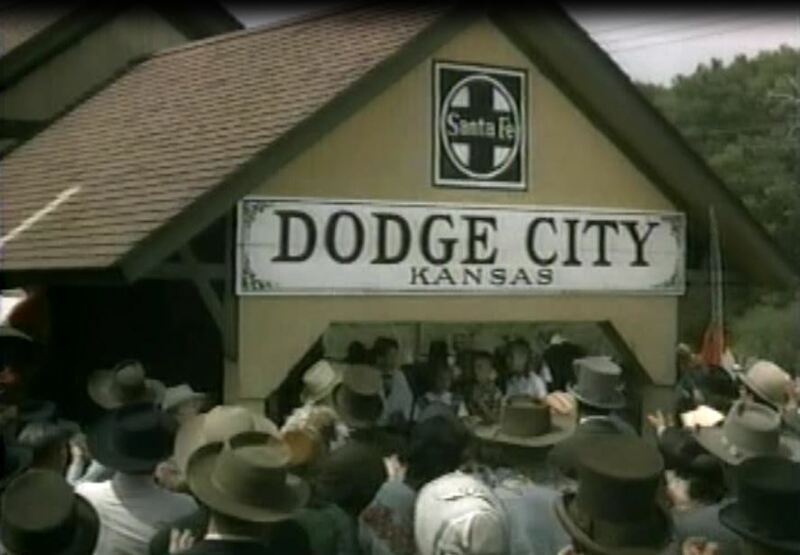 Yet another celebration, this time at Dodge City, Kansas (completion of the line to the Colorado border, thus gaining all that lovely land grant trackside through Kansas); There’s the AT&SF 9440 again (renumbered from 2440 in 1945). 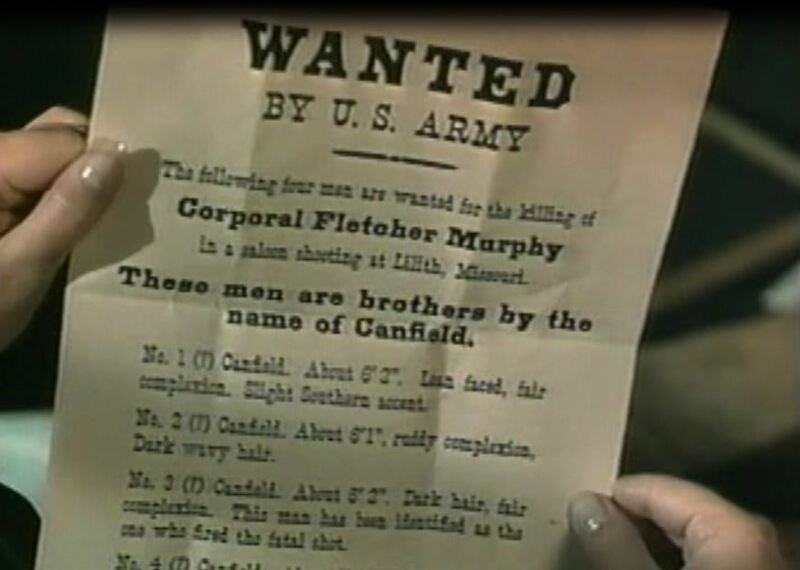 Those battlin’ Canfields are at it again. 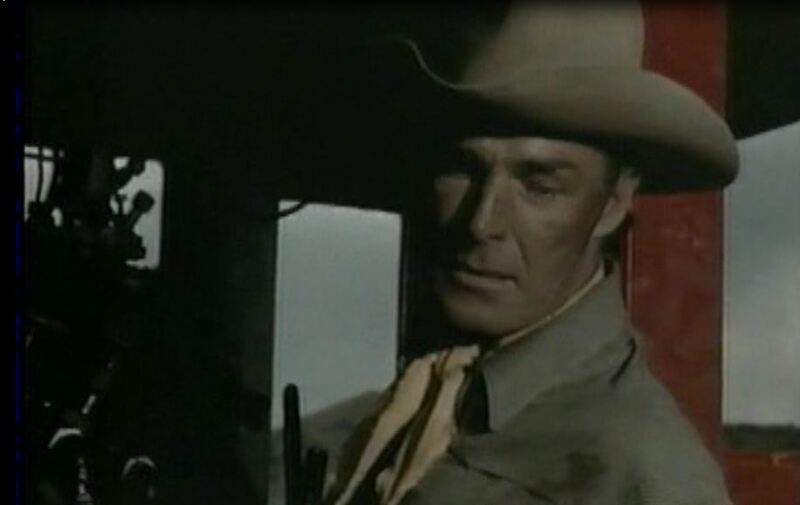 The hapless fireman gets plugged whilst taking on water and Randolph Scott returns fire from the depot. 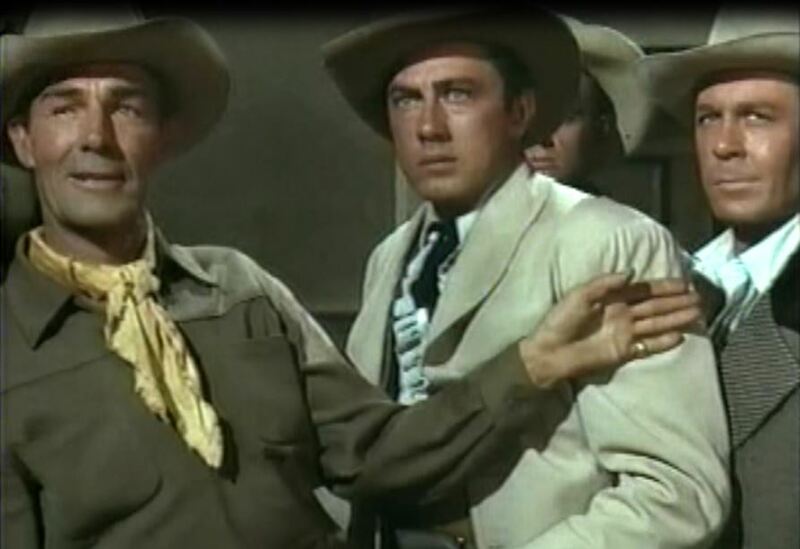 The bad guys make their getaway; The law’s catching up with the Canfields — Britt’s beloved Judith gets the bad news about that little Missouri saloon “incident” at the beginning of the picture. Big fight! 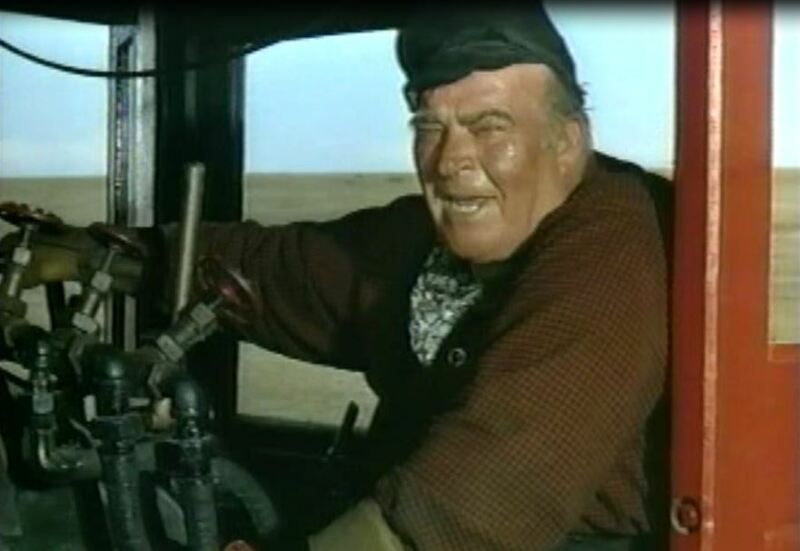 Randolph Scott finally has it out with villian Cole Sanders as the train rumbles through the night. 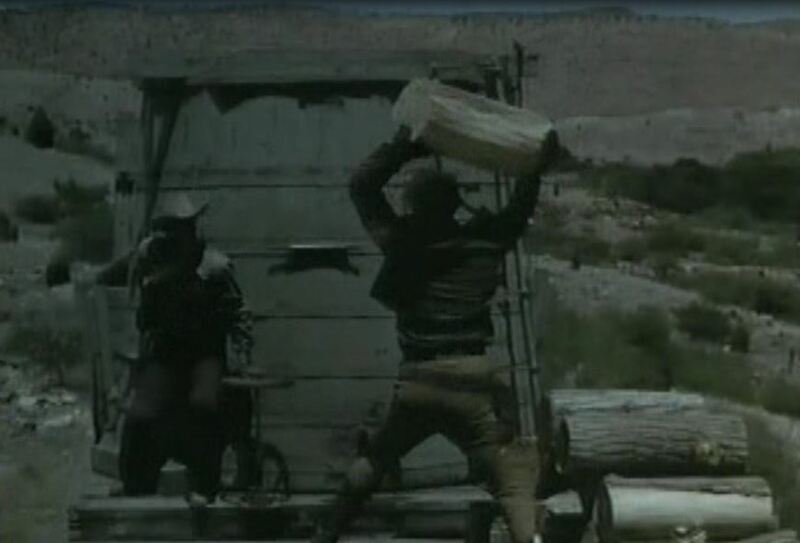 How did he miss with that huge chunk of wood? 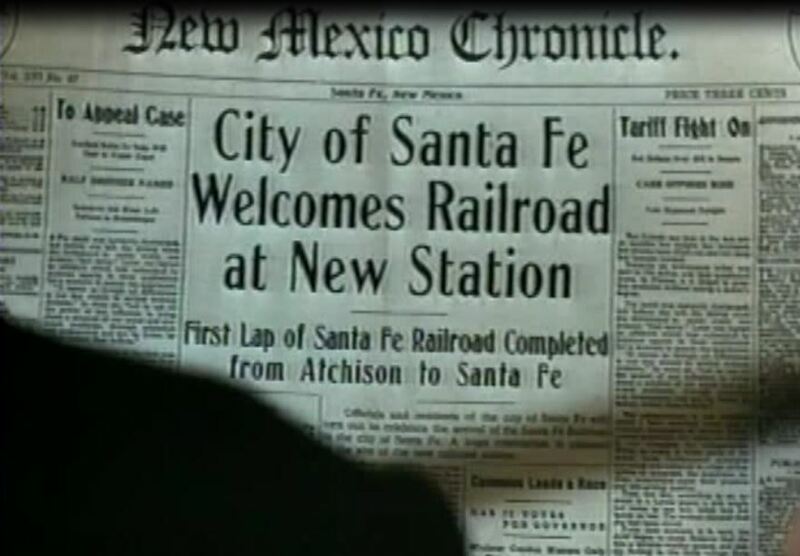 Having disposed of Sanders, Britt eases the train to a stop; The New Mexico Chronicle celebrates Santa Fe’s new railroad depot. Also, a tariff fight is on and a case will be appealed! 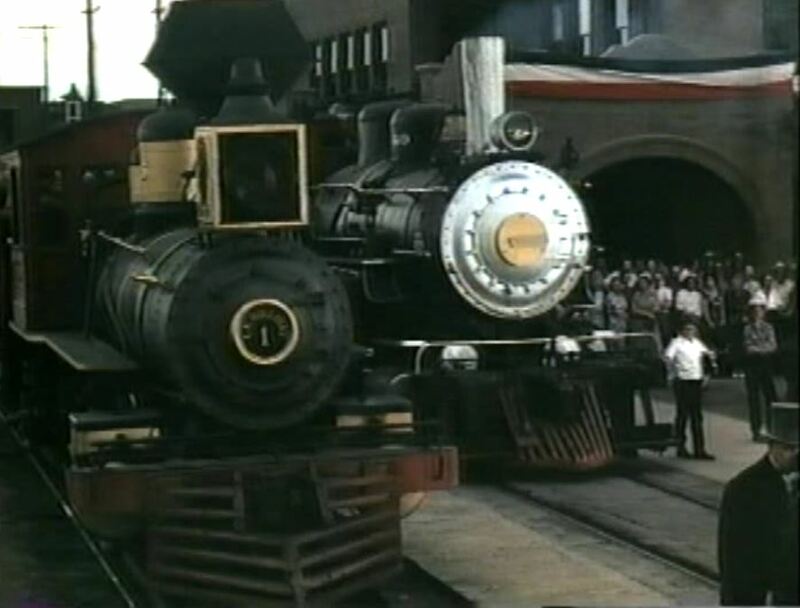 Final shots of ATSF #1 and #9440 side by side as the good citizens of Santa Fe celebrate the coming of the railroad. 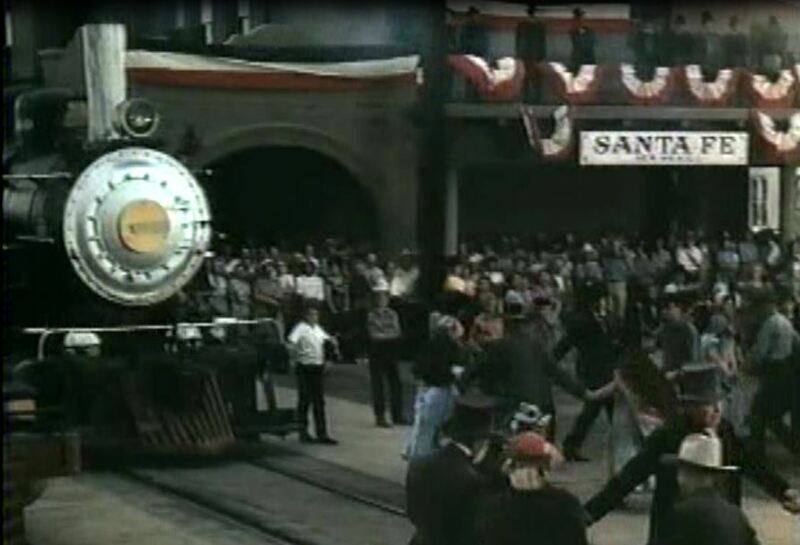 This entry was posted in Uncategorized and tagged Atchison Topeka and Santa Fe Railroad, Colorado, Columbia Pictures, Kansas, Little Buttercup, New Mexico, Randolph Scott, Santa Fe #5, Santa Fe 1951, Santa Fe Railway, Steam Locomotive, Super Chief. Bookmark the permalink.